An artist's rendition of the Northlands Coliseum in Edmonton. Rexall Place hosted its last Edmonton Oilers game on April 6, drawing attention from around the world. For me though, it will forever be the Northlands Coliseum. It may soon be consigned to the dust bin of history, but the Northlands will always hold a special place in my heart, with a wealth of memories. 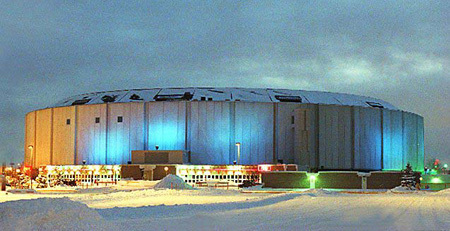 Growing up in the 1980s, the Northlands Coliseum was always front and centre on Hockey Night in Canada. It was the home of the Edmonton Oilers who, by the mid-80s, were contending for and winning Stanley Cups. Their home ice became a fixture on TV broadcasts, especially since they won four of their five Stanley Cups on home ice. From my perch on the farm, I never thought I’d ever see an NHL hockey game. It didn’t even dawn on me how close I was, when I left home for university in Edmonton in 1987. That soon changed, as did my perspective of the world. My horizons were set to expand and soon. It was in February of 1988 that my beloved Boston Bruins came to town. My roommate and best friend growing up, Chris Vining, and I secured tickets to see them play. The university’s engineering students periodically ran events that included a party, ticket to an Oiler game, and bus ride there and back. One of the engineers on our floor got us a couple tickets to see the game – and I was pumped. Chris had already gone to see games at the Northlands before, including a Chicago game with the engineers earlier in the year. It would be my first time, and I will never forget it. As the bus approached, the stadium began to loom in the distance. It was actually pretty surreal. What I had seen so many times on TV, that stadium with the blue hue, was now right in front of me. It was even more impressive inside. The biggest arena I had been in to that point was the Lethbridge Sportsplex, where the Lethbridge Broncos then Lethbridge Hurricanes played. The Northlands dwarfed the Sportsplex. I was struck by the size when we walked to our seats. The Northlands looked like the Sportsplex – with a whole bowl added on top. It was massive. That’s when I also first really understood what nose-bleed seats meant. We had a long walk up, and were almost at the top of the arena. We were so high we could look down into the broadcast booths. In fact, I tried to check out their monitors for replays once the game started. To make the experience complete was Paul Lorieau coming out to sing the national anthems, and the rink announcer I had heard so many times before on the farm. It was just like TV – except I was there! The Bruins would win that game 7-4, giving me the perfect birthday present. But that was just the beginning of my experiences at the Northlands. We saw the Oilers beat the Calgary Flames later that same season. The next year, I was back in the rafters to see Wayne Gretzky play his first game back in Edmonton after his much-talked-about trade to the Los Angeles Kings. Our seats were so high up, I could actually reach back and touch the wall, near where it met the ceiling. I would see the Bruins a few more times, and the Vancouver Canucks once. I saw the expansion San Jose Sharks make their first visit to Edmonton, sat right behind the net to see the New York Rangers, and was sitting ice level to see the Minnesota North Stars. The North Stars may have been the biggest team I saw in person too. I accompanied my friend Mark Saxton to see his beloved Buffalo Sabres play once. I befriend a man who was wheelchair bound and loved hockey. I acted as his attendant, sitting by his side in the seats reserved for people with wheelchairs and their aids, to see rookie Teemu Selanne with the Winnipeg Jets and the great Peter Stastny in his final few years with the New Jersey Devils. My last hockey experience at Northlands, which by then was the Edmonton Coliseum, was in the summer of 1996. I had this friend who worked for Peter Pocklington, and needed some help with an event called “Breakout ‘96”. It was a street hockey tournament right in the coliseum parking lot. It was a lot of fun, and I still have a shirt and a couple cups from the event. Hockey was far from the only reason I went to the Northlands Coliseum. There was also music. Again, I never in my wildest dreams on the farm thought I would ever see any of the musicians I heard every day on the radio. That changed in the fall of 1988. It was impossible for me to believe but Boston, my favourite band, was coming to Edmonton. It would be their first trip ever this way. I heard one of my floormates in res was getting tickets, and I asked if she could get me one. She did and, a month or so later, I saw my favourite band play all my favourite songs. Next up was Chris DeBurgh later that school year. We were down on the floor for that one, unlike Boston where we sat in the stands, albeit quite low down with the glass removed. The last one I saw was Bryan Adams. It was initially sold out, but organizers opened up seats behind the stage, so a buddy scooped up a bunch of those and we saw it. That was awesome too, because Bryan Adams was not only one of my favourites, but a Canadian icon. I was glad to see him. The other day on the news, Mark Messier, one-time captain of the Edmonton Oilers, said a building can take on a life of its own. He and all his former teammates could feel that in the Northlands, which held a lot of memories for them. It held a lot of memories for me too. Not just hockey games and concerts, but the times they were in and the people I was with. It was a great place because it gave me a lot of great memories, but it did the same thing for thousands of others. It may have become the Edmonton Coliseum, Skyreach Centre, and Rexall Place, but to me it will always be the Northlands Coliseum, a quaint, friendly, comfortable place to watch a game.